I like Indian and Pakistani vegetarian dishes and have been preparing more of them lately so that I can share them with vegetarian (and gluten-free) friends; I’d not made biryani before, so here’s my first go at it. This is like my Vegetable Pulao recipe, but with slightly different spices and vegetables. I made a large amount, perhaps 8 servings. Preparation: In a large pot, melt the ghee, add the spices, cook for a couple mins over medium heat; add the rice to brown slightly, and then add the water, stir and cook rice as usual, covered over low heat. Preparation: While the rice is cooking, prepare the following in oil (in an oven-safe pan if possible) over medium heat, in this order, progressively: carrot, onion, nuts, spices, garlic, ginger, habanero, green beans, stirring regularly. When those vegetables are mostly tender, add tomato/water purée and reduce until carrot is tender. When rice is done, stir tenderly into the vegetable mixture, e.g., with a bowl scraper. Once I did this, the dish was still too moist, so I baked it at 350° F for 20-30 mins to reduce moisture and create a slightly dry consistency on the exterior. Preparation: before or during the preparation of rice and vegetables, mix thoroughly and let sit. Serve the biryani with the raita on the side. My desi housemate visiting from Bangalore approved of it; that’s a pretty good measure. This was my first attempt, so if you have suggestions, please let me know. The baking may be unnecessary if the water amount was corrected (e.g.., 2 cups water per cup of basmati rice), but I like the slightly crispy texture and browning it adds to the biryani. Also, the habanero spiciness was nearly undetectable; if you like spicy foods, I’d use 2 or 3 habaneros for this amount of rice. Here’s a spectacular salsa that I’ve been making for 15 years – Salsa Romesco, with a surprising ingredient: almonds! If you’re a friend to whom I’ve given salsa, it almost certainly was this one. The particularly nice qualities of this salsa are its sweetness from red pepper, its relatively smooth, thick consistency (e.g., for dipping chips or as an enchilada sauce), and its easily adjustable heat simply based on the amount of powdered cayenne pepper. I’ve included the original recipe below. In a moment of farmers’ market enthusiasm, I bought a 25 pound box of tomatoes for $10. It turns out that’s a lot of tomatoes! I oven-roasted about half of these large, wonderfully red tomatoes to make 4 slightly different salsas. 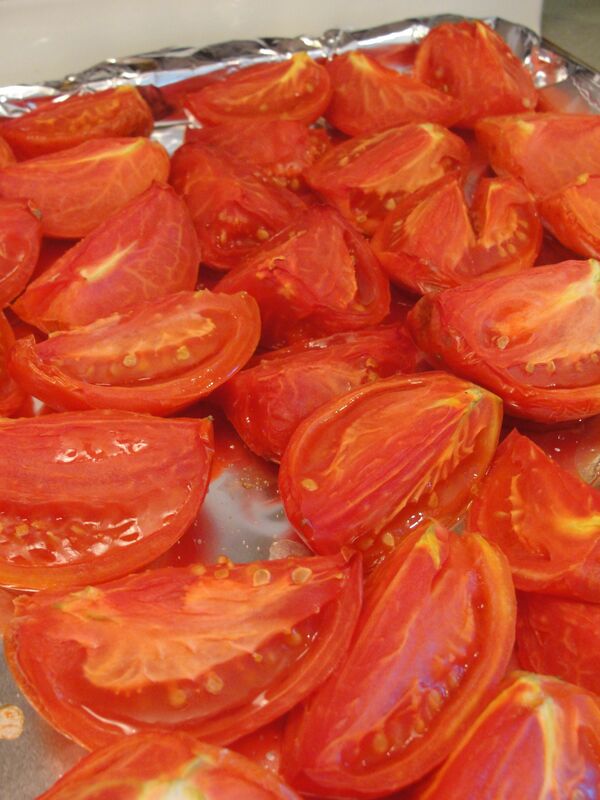 To oven-roast tomatoes, simply cut them and lay them out on a sheet in a 250° F oven for 2-3 hours. I put a bit of salt on on them beforehand. Large tomatoes can be quartered and roma tomatoes, as the original recipe called for, halved. 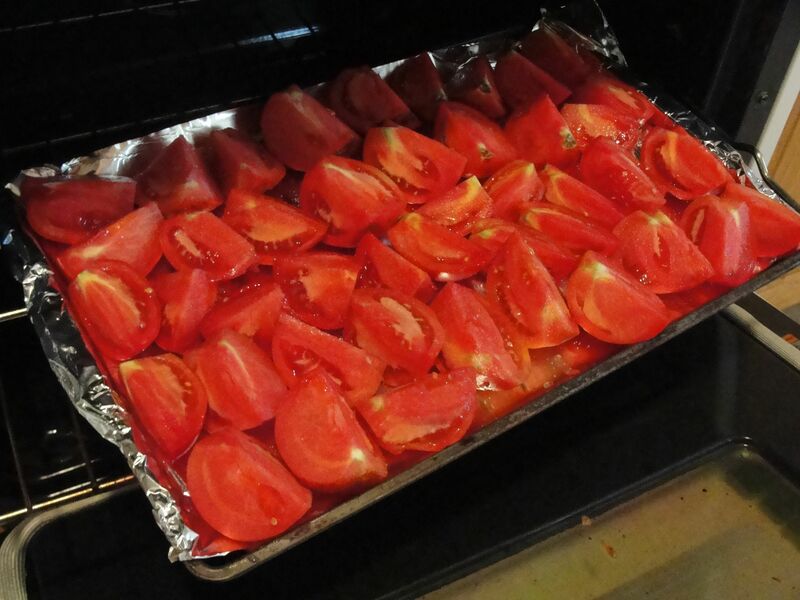 Quartered, and salted, tomatoes ready for oven-roasting. 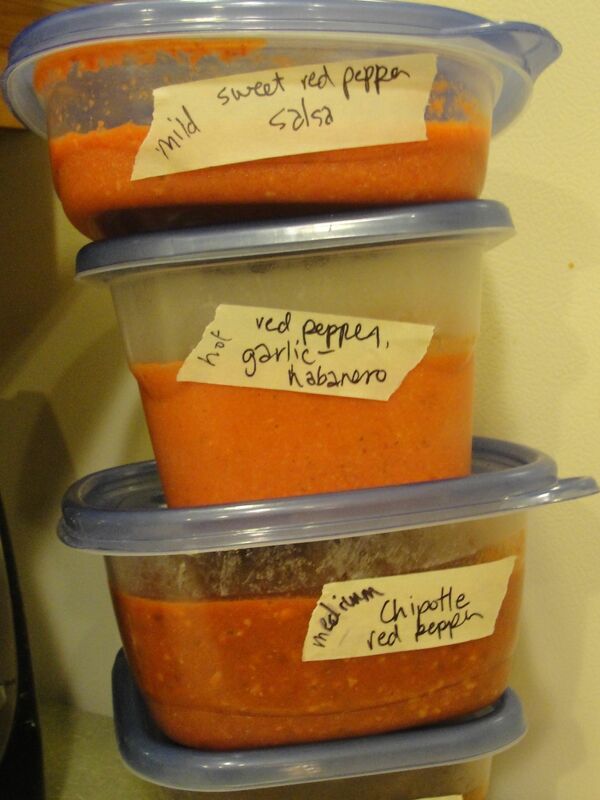 I’ve made this Salsa Romesco many, many times (recipe below), spiced just with cayenne. This time I also rehydrated some pasilla and chipotle (meco type) peppers while the tomatoes were roasting, and finely minced one seeded, deveined fresh habanero. 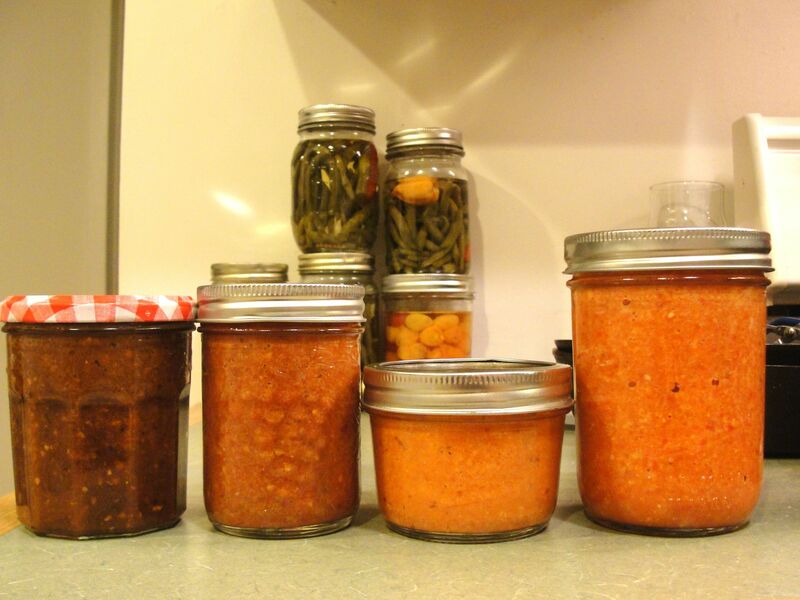 This was to make salsa variations with differing hotness and flavors. My pasilla peppers happened to be considerably hotter than the chipotle… many pepper varieties’ hotness is somewhat unpredictable. Once the tomoatoes are roasted, you can simply blend them in a food processor or blender for sauces and salsas. After the passive hours of roasting tomatoes and rehydrating peppers, you’re ready to make this salsa; everything is blended, so there’s not much chopping. 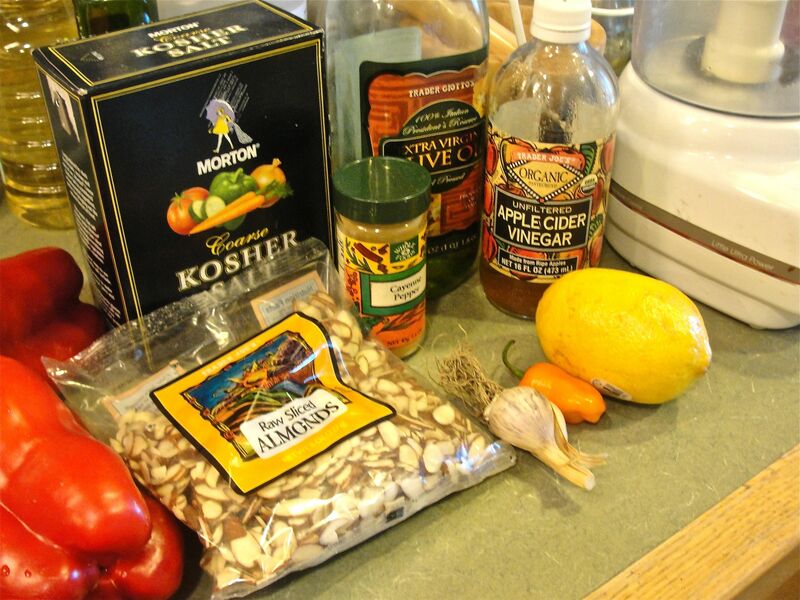 Ingredients, in addition to tomatoes, needed for Salsa Romesco. There is a bit of work; you will need to remove the skins from red peppers. I suppose removing the skin is optional, but it does two things: (a) it makes the salsa sweeter since the skin imparts a little bitterness, and (b) it keeps the skins (mostly) out of the resulting salsa, so it doesn’t get stuck between your teeth. 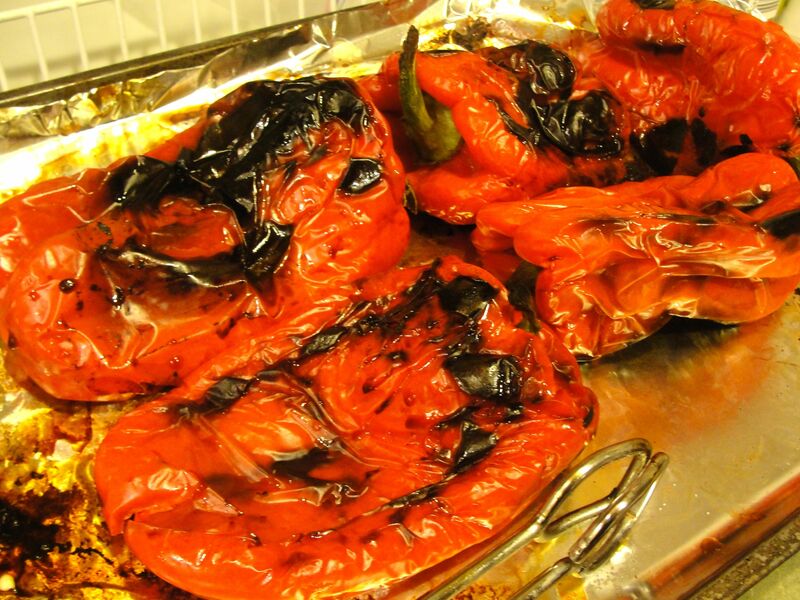 For me, the easiest way to roast and peel bell peppers has been to place them on a foil-lined sheet very near the heat in the broiler, watching them carefully and rotating them until all sides are blackened as shown. Place the roasted peppers in a plastic bag or covered bowl for a while to steam them (helping the skin to separate), and then peel them (as best you can), remove core and seeds, and rinse the pepper. Place all ingredients in a food processor or blender and purée. Variation: Add 1 anchovy filet to the food processor. Note: This is a classic Spanish salsa. 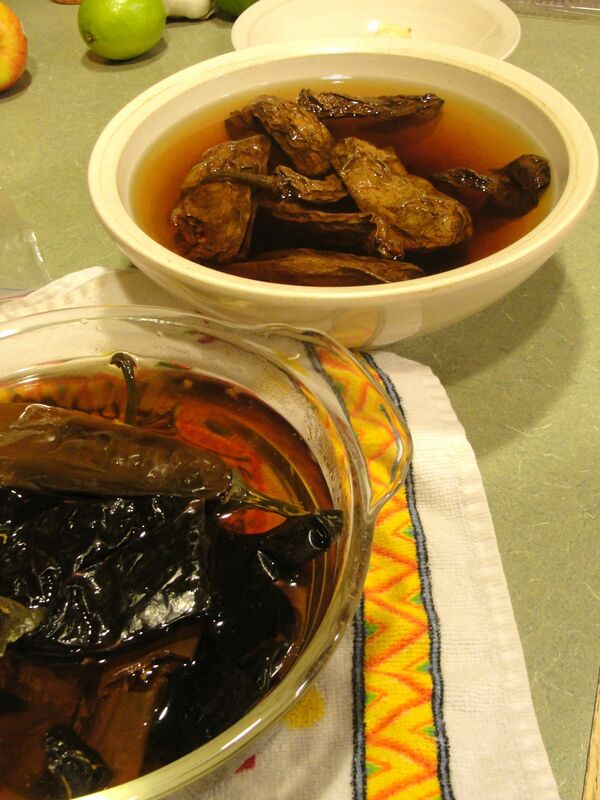 Serving suggestions: A versatile salsa, good with tortilla chips or as a dip for vegetables; with grilled meats fish or eggs; or as a soup garnish. I shared them with friends and all were popular but my favorites were the hot pasilla and the hot (fresh) habanero and garlic. As I said, this salsa is my favorite to make myself and is a great foundation for creativity.